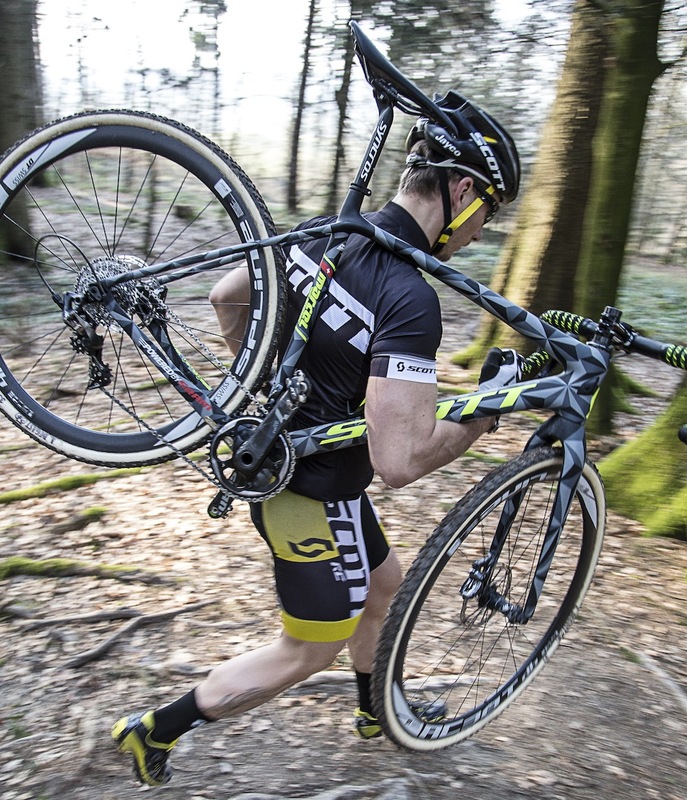 Scott has taken the Addict cyclocross bike back to the drawing board and come up with the lightest disc brake cyclocross frame on the market, with a complete bike coming up sub-seven kilograms. The Addict’s frame weighs a claimed 890g, whilst the disc fork weighs 390g, for a total weight of less than 1.4kg for a size 54cm frame – significantly lighter than the competition. There’s a tapered headtube and a BB86 bottom bracket for the usual stiffness benefits, with the bottom bracket also allowing wide placement of the chainstays for mud clearance. Scott has used different tube geometries for different frame sizes, so that stiffness characteristics are consistent throughout the size range – an increasingly common approach. Both the top tube and the front of the head tube are flattened to provide more comfortable portability. The rigidity theme is continued with 12mm thru axles: 142mm at the rear – both a departure in diameter and width from the 15 x 135mm axles which seem to have been gaining currency for thru-axled CX bikes. Thru axles also ensure more consistent positioning of the brake rotor in the caliper, reducing the need for adjustment. The axle screws have a wide pitch, so that they screw tight more quickly. The frame has been designed with mud-shedding features too. The chainstays have a top edge which tapers, so that mud is less likely to collect on them and there’s clearance for tyres of up to 40mm section. All gear and brake cables or hoses are routed internally and there’s mechanical and electronic shifting compatibility. There’s even future proofing to internally cable a dropper post and the frame is 1×11 drivechain ready with a removable front derailleur hanger and chainguard, which can be replaced with a chainguide. In Europe the bike will be available from the autumn as a CX10 model equipped with SRAM Force 1×11 drivetrain with 42 tooth chainset, 11-36 cassette, hydraulic braking and Syncros clincher wheels. Price is 5999 euros – UK prices to be confirmed. The CX20 has a 22 speed Shimano 105 drivetrain with 36/46 chainset,11-32 cassette and hydraulic braking. This model is priced at 3499 euros.